Nearly every basketball hoop manufacturer has a height adjustment mechanism of some sort. These height adjustment mechanisms can be as simple as a turn crank, or as complicated as a pneumatic piston lift. This post will discuss the different options available from each of the major manufacturers. Goalsetter provides one of the most basic, but effective height adjustment mechanisms. Their height adjuster is a simple crank system. The unique part about their mechanism offering is that you have a choice of an internal or external location for that mechanism. The internal design encloses the majority of the cranking components inside the main pole of the basketball system. Whereas the external design has the majority of the components outside of the pole. The internal design typically costs $100 more than the external mechanism. Goalsetter is actually one of few manufacturers that also makes a fixed-height backboard system in the high end of basketball goals. Spalding and Huffy have several different types of height adjusters. Their most basic mechanism is their pole height adjuster, which requires the use of a broom stick to engage the mechanism. This mechanism is typically referred to as Exacta Height. From there, they have a handle-engaged mechanism that slides up and down a pole system. Lastly, Spalding and Huffy's high-end goals will have a turn crank mechanism, typically referred to as U-Turn. Lifetime Products, like Spalding, has low-end and high-end basketball goals. Their low-end systems will have a broomstick enabled mechanism called the Quick Adjust. From there, all the rest of their mechanisms are handle-engaged mechanisms. One of these is called the Action Grip, which uses counterbalance springs to raise and lower the backboard in 6-inch increments. The next mechanism up is called the Power Lift, which is a pneumatic device that raised and lowers the backboard height in infinite increments again with the use of a handle. Lastly, Lifetime's high-end basketball goal line, the Mammoth basketball hoop, uses what is called the Rapid Cam and Mammoth Pump. These are also pneumatic devices engaged by the use of a handle, but are much more robust than the Power Lift mechanism. Goalrilla, much like Goalsetter, uses strictly turn cranks to raise and lower backboards. All 3 of their systems will use the same crank, which allows height adjustment mechanism from 7.5 feet to 10 feet in infinite increments. These are the height adjustment mechanisms available from the major basketball hoop manufacturers. Choose whatever mechanism is best suited for your basketball hoop needs. 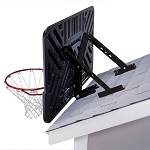 Adjustable Basketball hoops are a wonderful addition to your driveway. You can put them down low for younger kids. And raise it up higher for older more competitive kids. Enjoy you adjustable basketball system! Our family has both a Lifetime hoop, and a Goalrilla hoop. They both have adjustable mechanisms. Quite frankly, I prefer the Lifetime adjustment mechanism. The Goalrilla is so hard to adjust. My dad and I together with me hanging on the rim or lever, can scarcely bring it down, and then it leaves you sore for the rest of the day and hurting in your back or arms. On the other hand, the Lifetime hoop is easy to adjust. You just grab the lever and pull, the hoop locks into place, and VUOLA! Everything is perfect. And trust me it's just as simple as it sounds. One of the greatest system[s] I know, thank you extremely a lot.